This post is part of our online forum in honor of Sandra Bland, coinciding with the third anniversary of her death. The forum includes historical and contemporary perspectives–and creative pieces–on Black women’s susceptibility to state-sanctioned violence. 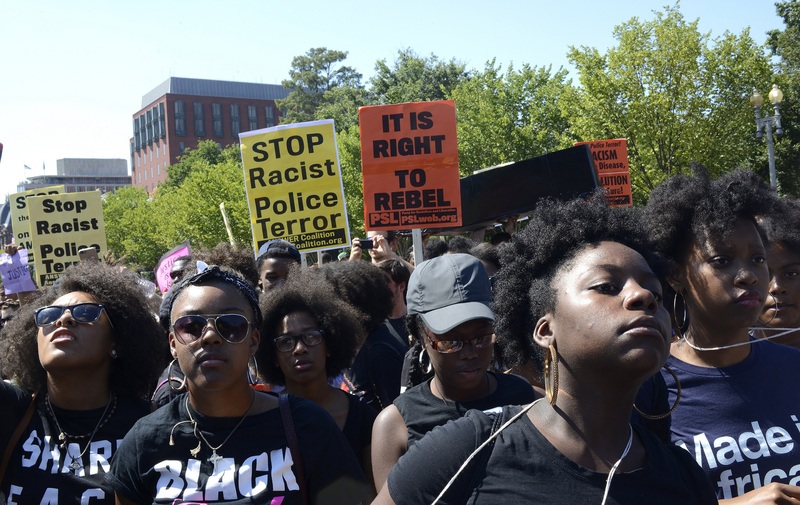 The Blackout DC march against police killings, August 2015 (Photo: Stephen Melkisethian, Flickr). In the early summer of 2015, I was walking from New York University’s Bobst Library on the south side of Washington Square Park to Fifth Avenue. I was running late, and so when I encountered a thick crowd in front of Washington Square Park’s arch, my initial response was irritation. But as I squeezed through the crush of bodies, I stopped as I realized what they were watching. Three white policemen were confronting a Black woman. I don’t know the reason for the confrontation, but what I do know is that she jerked her hands away from one police officer’s grasp, and suddenly she was on the ground with his knee on the small of back, her shoulders wrenched behind her, and her hands cuffed. In a final act demonstrating his power and her helplessness, the officer pulled up her skirt. That day is laser etched into my mind for many reasons, but primarily because in that moment I felt a range of emotions: disgust, fear, but also uselessness. As a Black woman myself, I feared what the police could do to me if I intervened. As an attorney and historian of the African-American and African diasporic experience, I wondered what the utility of my years of training was if my ability to help this woman on an individual level was so utterly circumscribed. I left the scene that day feeling impotent and paranoid. In the days and weeks after that disturbing scene, I compulsively searched the internet for any videos that observers had posted to see if anyone had started a discussion of the injustice they had witnessed. I perused the local newspapers for any mentions of this mystery Black woman and her police encounter. Given my knowledge of how Black women are made invisible in the United States, I should not have been surprised that I couldn’t find anything. For some reason, however, I was. The last few years filled with protests highlighting Black men’s vulnerability at the hands of the police and the state. In 2014, the Black Lives Matter (BLM) movement organized their first protest surrounding the murder of Michael Brown by Ferguson, Missouri, police officer, Darren Wilson. That protest turned BLM into a global movement, with local chapters organizing protests around the United States and the world. 2014 and 2015 became about protesting the murders of Brown, Eric Garner, Tamir Rice, Freddie Gray, Akai Gurley, Laquan McDonald, and Walter Scott. But as BLM co-founders, Alicia Garza, Patrisse Khan-Cullors, and Opal Tometi have emphasized, the focus was never supposed to be exclusively on Black cis-gendered men. In fact, from the start, as a movement founded by Black women, BLM has recognized the need “to highlight the egregious ways in which Black women are violated.” Thus, it is critical to remember not only the Black men who have fallen at the hands of law enforcement, but also the Black women. These are women like Tanisha Anderson, who Cleveland police murdered in 2015 when they responded to a call from a family member concerned about Anderson’s mental health. Tamir Rice’s murder happened only ten days later, which eclipsed Anderson’s. These are women like Mya Hall, shot when she drove an SUV into the gates of the National Security Administration building in Baltimore. The few reports that were released after Hall’s death noted that police emphasized that she was high at the time and spent an undue amount of time focusing on the fact that she was a transwoman. They are women like Pearlie Golden, who at ninety-three was killed by a police officer responding to a domestic disturbance. Golden was allegedly upset because her nephew had confiscated her car keys after she failed her driving test and was holding a gun. And, of course, Sandra Bland, who was reportedly found hanging, dead, in her jail cell three days after being arrested by a Texas state trooper in July 2015. As Andrea Ritchie has noted in her recent monograph, which beautifully makes visible the lives and deaths of the Black women mentioned above, police have often highlighted mental illness as a justification for the use of force against, and the detention of, women of color. For example, Anderson was bipolar and acting strangely; Golden was upset and wielding a gun; Hall was transgender and an addict. In the Sandra Bland case, she was initially arrested because she was insubordinate and perceived as unstable. After her mysterious death, the State of Texas has maintained that she committed suicide. The Waller County Sheriff’s office immediately released documents indicating that during her intake, Bland had admitted to being suicidal in the past year and had on at least one occasion attempted to take her own life with an overdose of pills. Jail officials later alleged, in motions submitted to a U.S. District Court, that Bland took her own life because she was distraught over her family and friends’ inability to post a bail bond for her release. Others have postulated that she was murdered. Some have even gone so far as to allege that her eyes were taped open in her mugshot so that she would appear to be alive. It does matter whether Texas police are engaged in a cover up. This is an issue which goes to the core of whether the instruments of American democracy are trustworthy. However, my question is this: whether police and state violence were responsible for violating Sandra’s body—physically murdering her—or Sandra’s mind—leading her to commit suicide—does it make her any less a victim of police and state violence? No. Much of the scholarship focusing on state and police violence against Black bodies concentrates on explosive, physical, and immediately visible acts of violence—bullets, tear gas, chokeholds, Tasers—and how these are used in order to control and subdue Black populations. However, more damage is wrought, and on a larger scale, by what environmental historian Rob Nixon calls “slow violence.” This violence occurs incrementally, and is assisted by structural racism, classism, and misogyny. Just as the health and economic effects of nuclear waste leaking from a plant next to a poor, Black neighborhood increase over time, so does the impact of systematic dehumanization and criminalization of the Black female body. As historians Hannah Rosen and Kali Gross have argued, beginning with Reconstruction, the United States has resolved its anxieties about Black citizenship by exerting and condoning sexual and physical violence against Black women and by creating narratives which positioned Black women as especially sexually and criminally deviant. Cumulative violence affects Black women holistically, and recently, the mental health of Black activists has come into focus. In the past two years, five prominent Black activists have died from suicide, homicide, or “natural causes.” In December 2017, Erica Garner, the daughter of Eric Garner, died of a heart attack at age twenty-seven. The cause of death was a pre-existing heart condition exacerbated by Garner’s pregnancy. But the activist often complained of stress stemming from the difficulty of her activism, her precarious economic situation, and simply enduring the micro-aggressions attendant with being a Black woman. I am in no position to know what was in Sandra Bland’s mind on the day she died, but along with the potential for a bright future lay the scars of a difficult past. Like many Black women she struggled with depression and had not sought mental help for either the loss of a pregnancy that she had in 2014, nor the death of her grandmother the same year. In March 2015, Sandra posted a video to her YouTube channel admitting that she had “really been struggling” with depression and PTSD. The reasons for this struggle was likely both personal and financial. Bland was deeply in debt from fees associated with traffic tickets, misdemeanor marijuana possession, and driving while under the influence. These charges had plagued her, making it difficult for her to obtain steady employment. Given these circumstances, it is not unreasonable, then, to assume that in that jail cell in July of 2015 she felt overwhelmingly helpless and discarded. But no matter how she died, the state failed Sandra Bland as surely as it failed Michael Brown and Eric Garner. So what can we do? For one, Black women, women of color, and their allies can remember to take care of themselves and each other. But secondly, as academics and historians we can make a commitment to ensure that the histories of violence against Black bodies do not render the sacrifices of Black women and girls invisible. In keeping Sandra’s memory alive, we resist the impulse to continue to discard the importance of Black women’s lives and contributions in American history. We must challenge ourselves to save and to continue to uncover these hidden narratives. I write this for Sandra Bland, Tanisha Anderson, Mya Hall, Pearlie Golden; for that unnamed woman on Fifth Avenue; and for all Black women whose lives, bodies, and minds have been affected by state and police violence. Rest in peace. Rest in power. Alaina Morgan is a historian of race, religion, and politics in the African Diaspora. She is a Postdoctoral Fellow in Islam in North America in the Department of Religious Studies and the Sohail and Sara Abbasi Program in Islamic Studies at Stanford University. She is currently editing her book manuscript, Atlantic Crescent: Black Muslim Internationalism, Anti-Colonialism, and Transnational Community Formation, which explores the ways that Islam and ideas of Blackness were used by Muslims in the United States, the United Kingdom, and the Anglophone Caribbean to form the basis of transnational anti-colonial and anti-imperial political networks.